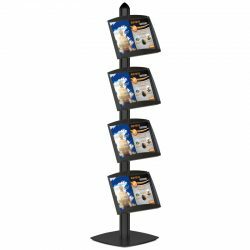 Free Standing Displays Stand with 22″ x 28″ Poster Size Black Snap frames and 2 x 8.5″ x 11″ Black Steel Shelves An ideal stand that allows various different models for indoor use. Black powder coated aluminum pole with four channels. Product is packed unassembled with an instruction sheet and fixing set. One can make up his own stand in desired variations. Heavy and stable steel base for public spaces. Single Sided. Each part is Black. Profile thickness of Snap Frame is 1″. 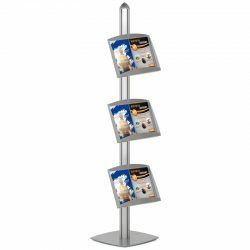 This pedestal stand is both a literature rack and a sign holder and with its simple yet elegant design, it is the best choice for presenting your graphics indoors. This literature rack is a 75-inch-tall sign holder and made of aluminum with an elegant Black powder coated finish. The sign holder has a heavy-duty base and is made out of durable steel which makes it last for a long time in any environment. It comes with one 22″ x28″ poster size Black, Snap Open Frame and one 2 x 8.5″ x 11″ Black, steel shelf. 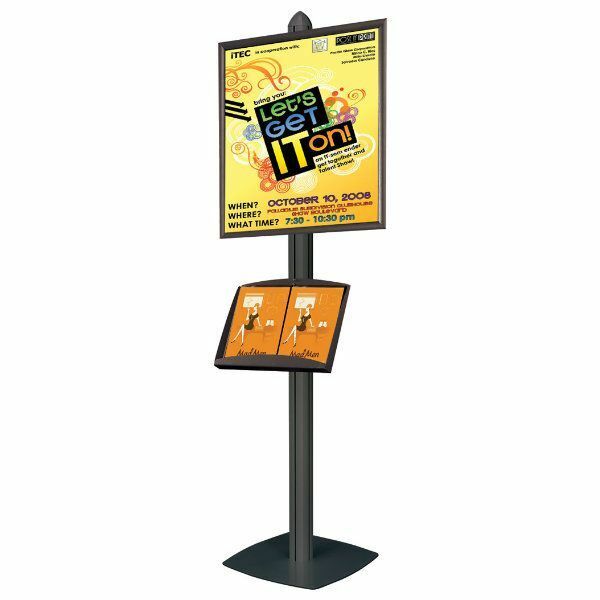 Snap open frame of this pedestal stand makes it easy to change your graphics within seconds! All you have to do is simply flip up all the hinged edges and insert your image under the anti-glare lens that is to protect you graphic from dust and dirt. You can also raise or lower your attachments on the pole just by sliding the connectors and position the literature rack according to your needs. The sign holder has four channels on its 73″ pole. 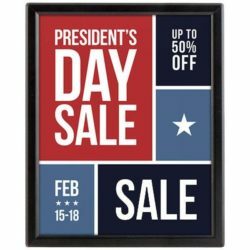 This single sided sign holder holds any 22″w x 28″h print in the frame and 8.5″ x 11″ literatures in its steel shelf. 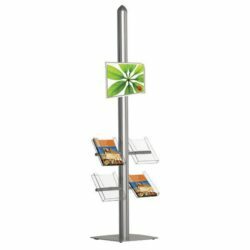 This pedestal stand with the literature rack creates a great advertisement space while distributing pamphlets and literatures directly. 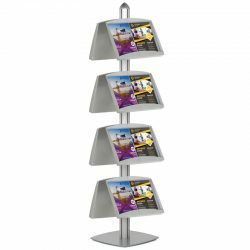 With this multifunctional feature, this poster holder is the ideal choice for advertisement and marketing purposes in high foot traffic. This sign holder is designed to draw attention to your literatures and graphics in busy places such as car dealerships, shopping malls, airports, theaters, exhibition centers, banks and hospitals. While this literature rack is commonly used for making announcements, it is also frequently used for direct sales. I was surprised at the excellent construction and look of this stand. It is eye grabbing because it different from regular stands. Great stand. I like the tray so that we can offer handouts for reminders.